Sweet 17 and raring to go! To start learning to drive you need to be at least 17 years old, which is the minimum age that you can legally drive a car on public roads in the UK. You can apply for your provisional licence three months before your 17th birthday and if you’re disabled and receiving mobility allowance you can start at the age of 16. Before you can start learning to drive, you need to obtain a provisional licence from the Driving and licensing Agency (DVLA). To apply for a provisional licence, complete forms DL1 and DL750 available from any Post Office or you can apply on line. Learning to drive as a British national, you will need to enclose two passport-size colour photographs, proof of your identity and a fee of £50 when you submit the forms. The DVLA aims to deliver your licence in about 3 weeks. More details will be with the application form. Different rules apply if you are an EU citizen or have come from outside the EU. Check with DVLA for details. Any visual condition which affects sight (not including short or long sight or colour blindness), for example, if you have sight in one eye only. If you have had sight correction surgery you should declare this when you apply for your provisional licence. This will not stop you from learning to drive, but it is necessary information. As you know, learning to drive involves taking a practical driving test. Before you get into the car the examiner will ask you to read a number plate on a vehicle. If it’s one with an old-style number plate the required distance is 20.5 meters (about 67 feet). Number plates with a narrower font, such as the new-style number plates introduced in 2001, need to be read from a distance of 20 meters (66 feet) and are easily identifiable, they start with two letters e.g. AB51 ABC. If you wear glasses or contact lenses to do this, you’ll be expected to keep them on during the test. Test your eyesight for FREE-before you start learning to drive-courtesy of the Eye test Simulator. As a learner driver you have to display “L” plates in a visible place on the front and rear of the car you’re driving. Until the day you pass the practical part of the driving test you’ll have to display these and drive with someone who has passed their test, but they must be over 21 years old and have held a full British driving licence for at least 3 years. When you start learning to drive, you’re responsible for making sure that any vehicle you drive is legal, roadworthy and properly taxed. When you learn to drive with Miles Ahead you can be sure that all these things are taken care of, so you can have stress free driving lessons. When you’re paying for lessons, the insurance should be covered by the driving school, as it is at Miles Ahead Driving School. If you’re practising with friends or family, it is your responsibility to make sure you’re covered on their insurance policy. Some essential reading, like the Highway Code, is a great place to start before you start learning to drive. Also start to practice your driving theory and hazard perception for FREE on our website and boost your skills and improve your chances of passing both the Theory and Hazard Test. You’ll find a range of materials designed to make learning as easy as possible . Learn to drive-learn to buy a car. Perhaps it’s not a good idea to buy your first car while you are learning to drive. Once you have actually passed both your theory and practical tests you will have the enjoyment of buying a car and getting on the road immediately. 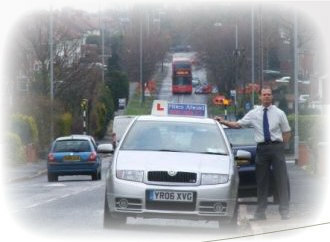 Some learner drivers prefer their own cars, but most use the school’s cars for driving lessons and the driving test. So, you’ve worked out how much learning to drive is going to cost you. Now you need to budget some more. Include in your expected outlay service, tax and insurance. The last two will be higher if you’re a new driver. Allow at least £1000 to get a car on the road. While you’re learning to drive, work out a rough budget of how much it’s going to cost you to run the car once the initial outlay has been made. Learning to drive includes questions on eco-driving. Give some thought to fuel efficiency. Not only is this good for the environment, but with the cost of fuel rising all the time, it makes economic sense. See our section on eco-driving for useful tips. Once people know you are learning to drive and intend buying a car, they will tell you plenty of horror stories about used and second-hand cars. Don’t be put off, just use your common sense and research. You will be more protected by a recognised dealer, who will charge a higher price but includes after-sales service and extra warranty, but you can still get a good deal from a private sale. Just make sure you double-check that the documents match the car. Take someone with you, to do a test drive, and get an insurance quote for the model you want so that you can factor it into your budget. Another option is a car auction-again, there are good deals to be had, but take someone with you who knows what to look for, and have a check-list. When you learn to drive, you learn lots of other things too! Learn to drive also means learning about tax. Everyone has to pay this, although it does depend on the size of the car and what kind of fuel it uses. The present government is trying to bring in cheaper tax rates for eco-friendly cars, so it’s worth checking this out. As a new driver, and particularly if you are under 25, expect to pay around £1000-£2000 for comprehensive insurance. However, it’s a competitive market, so do shop around. Remember too, that if you take “Pass Plus” within a year passing your test, some insurers will offer you a good deal. We at Miles Ahead Driving Lessons Birmingham are fully trained and experienced to deal with every aspect of your learn to drive queries. Use their expertise. we love to be asked! One of the biggest decisions when you decide to take driving lessons is choosing a good driving school. Of course price is important, but what’s really crucial is that you make sure you choose a reputable driving school with licensed driving instructors such as Miles Ahead Driving School. Learning to drive can be expensive, so do your due diligence. You can research on the Internet, and most driving schools will have a website, or are in the local business telephone directory. What is the main difference between large driving schools and small driving schools? The larger driving schools have got a pool of instructors so if your own is unavailable because of holidays or illness you’ll be offered a replacement without having to have a break in your lessons. Larger driving schools will also, have a pool of spare cars so if your own instructor’s car breaks down on test day, you will be provided with a replacement car. Most small driving schools operate from home and are generally a good choice as there personal reputation is very important so you will always get the best service, larger school instructors can sometimes hide less competent instructors who are covered by the good instructors at that school.The small school has to keep his car in tip-top shape as the buck stops with him if the car has problems. Most people choose to learn in a manual car. This means you gain a full driving licence and can go on to drive a manual or automatic car in the future. If, however, you pass your test in an automatic that’s the only sort of car you’re then qualified to drive. In an automatic you don’t have to learn to use the clutch and gears, it’s a much simpler task and means you can give more of your attention to what’s happening on the road. Help with the driving theory and hazard test? Most driving schools will offer help with the theory test in the sense of testing you with sample questions. If you feel you may have problems with the driving theory or hazard perception test you might want to choose Miles Ahead Driving School - we can offer you extra support. Most driving schools provide intensive driving courses. If you want to learn more quickly, it could be possible with an intensive course. With an intensive course you can learn in anything from a week to a couple of months. Don’t forget you’ll need time to pass the theory test before you take the practical driving test and during this time you can be taking driving lessons. Do all driving schools provide one hour lessons? No. When enquiring about driving lessons, check how long they are. The reason why some lessons seem so much cheaper than others is because you’re being quoted for forty-five minutes, rather than an hour. Many driving schools offer the option of having a motorway lesson after you’ve passed your test. Some are registered to teach the Pass Plus course. Miles Ahead Driving School offers post-test support to all its clients. 0121 377 8094 or 0781 7025 177. if no reply leave a message or text. Let the preparation begin-start learning to drive now!